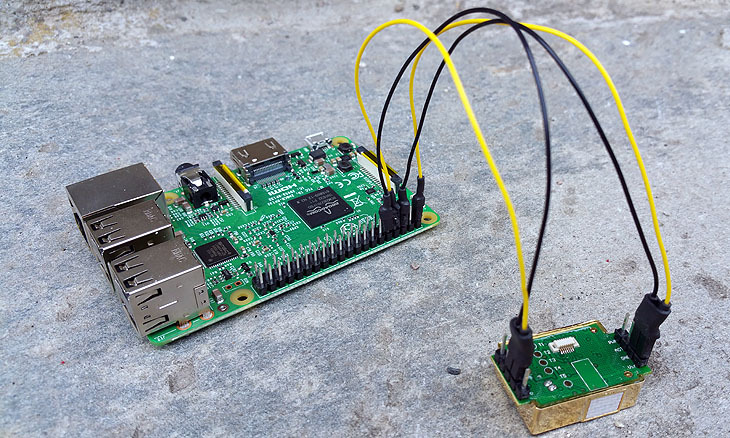 In this article we will do a simple functional test of the MH-Z19 CO2 sensor by connecting it to a raspberry pi 3 UART and run a simple datalogger python program which prints results to the screen and stores results in a csv formatted file. The file can later be imported to matlab or excel for further analysis or just plot a graph of the collected data. 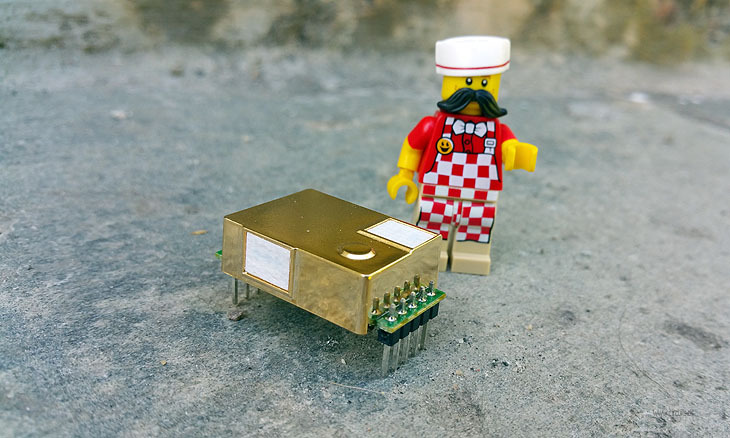 If you want to use a PC or Raspberry Pi or Beaglebone or any other SOC to measure CO2 levels, a sensor with a serial interface is a good choice. The MH-Z19 features a UART serial interface and 5V power supply and 3.3V IO levels. 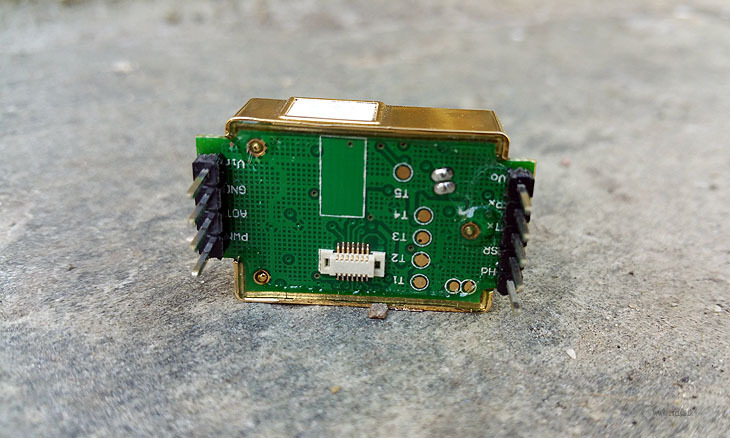 This makes is easy to connect it directly to a Raspberry Pi or to a PC (If PC, you need to use an USB/serial converter(CMOS/TTL levels, not RS232 levels)). It also features an pulse width modulated (PWM) output where the duty cycle changes with CO2 concentration which could be buffered and low pass filtered to get an analog signal representing the CO2 level. When breathing, humans and animals increase the concentration if CO2 in the exhaled air. This is a normal biological process. In the outside, this is not a problem as plants consume the additional CO2. Burning fossil fuels also increase the outside CO2 levels, and the plants cannot handle such a huge amounts which creates very negative long term effects, but that is not what we are talking about here. However, in closed living rooms without enough ventilation, CO2 levels can increase quite a lot from the initial outside levels of 400 ppm to inside levels of 2000-3000ppm. High CO2 levels, above 1000ppm, can lead to drowsiness, poor concentration, loss of attention or increased heart rate. Especially modern buildings without a well-designed ventilation system can be a bit problematic. Therefore, monitoring CO2 levels in living rooms is a good idea as it gives you a good indication when you should increase the ventilation (e.g. by opening the windows for some time). Large buildings like schools and office buildings have huge ventilation systems which use a lot of electric power just to make sure that the inside air is cooled or heated and replaced within a certain interval of time to make sure the inside air is of good quality 24/7. A lot of energy can be saved by controlling such a system based on strategically placed CO2 sensors around the building and run the system based on demand caused by occupancy rather than continuously or controlled by a simple timer. Such a CO2-based demand controlled ventilation system can control the amount of outdoor fresh air supply in a building depending on the number of people and their activity. People are the main source of CO2 in a building. If the number of people in a room is doubled, the CO2 level will accordingly double. If one or few people leave a room, the level of CO2 will proportionally decrease. Hence, demand controlled ventilation saves energy solely by not replacing, heating, or cooling, unnecessary amount of outdoor air. Fig.2. The MH-Z19 CO2 sensor manufactured by Winsen Ltd. The MH-Z19 sensor is manufactured by Winsen Lt., China and the measurement method used is based on the non-dispersive infrared (NDIR) principle to detect the existence of CO2 in the air. 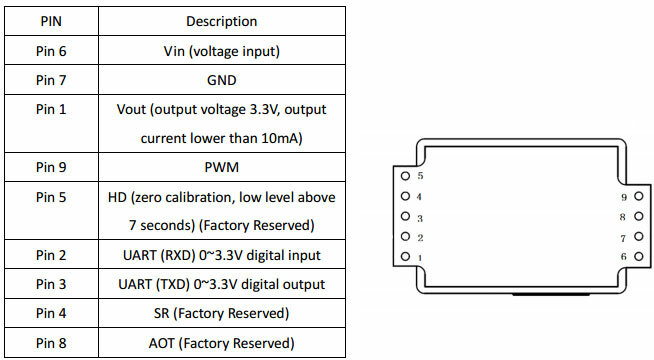 UART serial interface and Pulse Width Modulation (PWM) output. A nondispersive infrared sensor (or NDIR sensor) is a relatively simple spectroscopic sensor often used as a gas detector. It is nondispersive in the sense of optical dispersion since the infrared energy is allowed to pass through the atmospheric sampling chamber without deformation. The main components of an NDIR sensor are an infrared source (lamp), a sample chamber or light tube, a light filter and an infrared detector. The IR light is directed through the sample chamber towards the detector. In parallel there is another chamber with an enclosed reference gas, typically nitrogen. The gas in the sample chamber causes absorption of specific wavelengths according to the Beer–Lambert law, and the attenuation of these wavelengths is measured by the detector to determine the gas concentration. The detector has an optical filter in front of it that eliminates all light except the wavelength that the selected gas molecules can absorb. HVAC equipment in schools, office buildings etc. The pins have a 2.54mm (0.1″) pitch, that makes it easy to solder a simple one-row pin header as shown in Fig. 1 above. The MH-Z19 have a internal 5V to 3.3V low drop analog voltage regulator. This makes the logic signals on RX and TX compatible to the Raspberry Pi logic levels which are CMOS 3.3V. Hence, no level converters are needed. Preparing the Raspberry Pi 3 for UART communication. 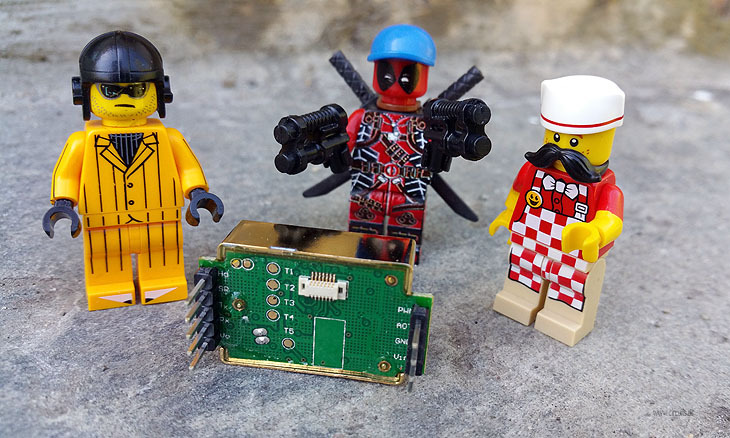 The Raspberry pi UART present on the GPIO (the 40-pin connector) requires some preparing before use. -Turn off the console if it is using the UART as login shell. -Enable the UART in the /dev/config.txt file. Detailed information on how to configure the UART on Raspberry Pi 3 can be found here. Save the testprogram above as mhz19.py. The figure below shows the output of the simple mhz19.py test program. The CO2 measurements are sampled every minute. Fig.4. Datalogger mhz19.py terminal output when running. Fig.5. MH-Z19 logfile csv format. All carbon dioxide sensors need calibration. Depending on the application, this can be accomplished by calibrating the sensor to a known gas, or using the automatic baseline calibration (ABC) method. Both have pros and cons you should know. The non-dispersive infrared (NDIR) carbon dioxide sensors rely on an infrared light source and detector to measure the number of CO2 molecules in the sample gas between them. Over many years, both the light source and the detector deteriorate, resulting in slightly lower CO2 molecule counts. To combat sensor drift, during calibration a sensor is exposed to a known gas source, multiple readings are taken, an average is calculated, and the difference between the new reading and the original reading when the sensor was originally calibrated at the factory is stored in EPROM memory. This “offset” value is then automatically added or subtracted to any subsequent readings taken by the sensor during use. The most accurate method of CO2 sensor calibration is to expose it to a known gas (typically 100% nitrogen) in order to duplicate the conditions under which the sensor was originally calibrated at the factory. Nitrogen calibration is also required if CO2 levels between 0-400 ppm will be measured. The problem with calibrating using nitrogen is the expense. A sealed calibration enclosure, a tank of pure nitrogen, and calibration software is required to match the original factory testing environment. Otherwise, the accuracy of the calibration cannot be ensured. Where maximum accuracy is less important than cost, a CO2 sensor can be calibrated in fresh air. Instead of calibrating at 0ppm CO2 (nitrogen), the sensor is calibrated at 400ppm CO2 (outdoor air is actually very close to 400ppm), then 400 ppm is subtracted from the newly calculated offset value. Fresh air calibration is best for sensors in manufacturing settings or greenhouses where the sensor is constantly exposed to different CO2 levels. Automatic calibration is based on the fact that in a common environment, the CO2 level comes back to the norm (400ppm CO2) periodically, at least every few days. 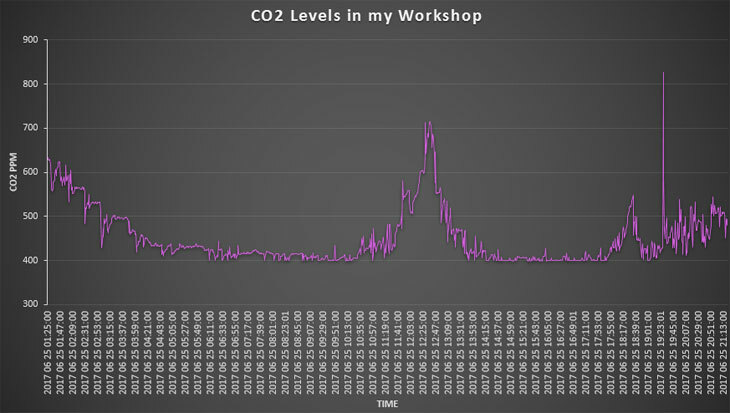 Starting from there, you can make your measurement software constantly monitor the lowest observed CO2 level over a period of several days. If these lowest values diverge from the norm, your sensor software could gradually make a correction to compensate for the change. This is an efficient and reliable method for a typical environment where the CO2 level goes back to normal when there is no CO2 production for a few hours: during the night for businesses, during the day for a bedroom. The MH-Z19 seems to work as expected. Do you have any idea what is the problem and how to fix it? Thank you in advance. It is good practice to use the “with” keyword when dealing with file objects. This has the advantage that the file is properly closed after its suite finishes, even if an exception is raised on the way. Thank you for your reply, Terje. I checked the code already before your comment, and line 47 is there. I just check again and I can’t find any other problems in the code. That’s why I felt so weird why it gave me that error. I thought it could be some other problems? Is there any other possibility that may cause the problem when you did the experiment? Thanks. Do you know what the problem is? 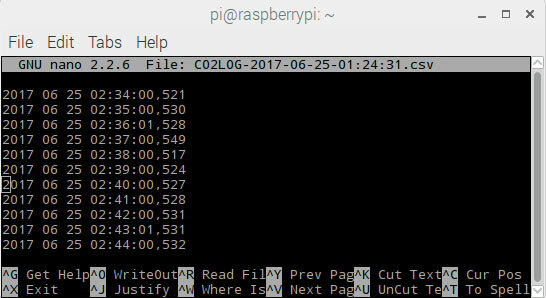 Is it the code or I did not setup the Pi or sensor right? that means that the code failed to read anything from the serial. I’m dealing with the same issue and I cannot figure out what is the problem. I checked the pinout several times. In the code used above if you place a backspace in front of every x, in the string to write to the serial port, it works like a charm. Man I looked at this for far to long to discover this..
Hope it helps someone not making my mistake. thanks for all information shared, is powerfull information. I am really interested in your post and try to follow the steps but I too have the problem with the f function not defined. Could you provide a code without the connexion to csv as suggested by Jia. I would be really great if you can provide us with a working code. I have an MH-Z19b that has wired pigtail attached. 7 wires yellow,green,red,white,brown,black,blue. Any idea on which wire goes to which pin? Hi while watching the the serial port I am getting this..
which raspbian version are you using? I cant get you script to run on the lastest. thanks for this article! I noticed that one obvious problem with the example code is that it does not show the “” -characters. There is small bug, ser.write(“xffx01x86x00x00x00x00x00x79”) is lacking the backslashes. Hello, I tried to make the mh z19 work with my pi2 on jessie, I got the same message as Jia, port index error : bytearray index out of range. Is there any issue to this problem? It looks like the website has removed all the backslashes from the Python script. That’s probably why people have been running into problems, as the incorrect command is being sent to the device. Also, people will get a weird error if an exception occurs before the file (f) has been opened.